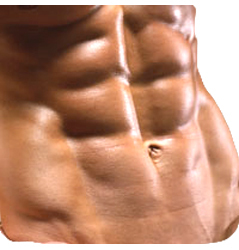 Exercise for six pack abs aims at two factors – build muscles and loose fat. Exercises shed all the excess fat from your stomach and builds or enhances muscles to define the six packs. Before getting on to work on your abs, it's important to know that the job of the abs is not only to flaunt a fat free stomach but to maintain the correct posture and stabilize the spine. Abs support the complete posture of your body. Thus, you also need to work on other muscles to support your abs. Squats are the best option for the purpose. 1.Squats – Squats works on your thighs, hips and lower body. 1.Select a weight which you an take on. 2.Bend your knees slightly, hold the weight from behind and rest it on your shoulder. 3.Your legs should be pointing outwards and should be in the level of your shoulder. 4.Now stand straight in this position and bend again. 5.Repeat it fro few times. 2.Crunches – Lie down on a mat. Touch your temples with your hand, shoulders straight and look ahead. Then lift your body completely with the support of your abs. You should never raise your lower body or take the support of your shoulders. When you raise your body exhale through your mouth, hold the position for sometime. Then exhale through your nose while lowering the body. 3.Leg Lifts – Lie down straight, pull up your leg to 90 degrees. Hold the position and then lower the legs again but don't touch the ground. Hold the strained position for 3 minutes. Repeat it for 5 times. 4.Static Hold Position – Place your body in the position of push ups. Raise your body partially and hold the position for atleast 5 minutes. It works on the whole core of the body by keeping it in an attention position. You can also lie down on your one side and lift your body. This works on your ram muscles and your spine. 5.Twisting Exercises – These exercises work on your oblique muscles. The muscles of your waist. One of the best twisting exercise is to sit down with back straight. Fold your left leg, so that from your thighs to knee is in straight position and the rest is curled behind your back. Fold your right leg upright and place your feet on the ground. Then twist your body in the opposite direction to touch the knee of your left leg. These exercises will make sure the toning of your entire body muscles, specially the abs and the oblique muscles. This helps you loose the excess fat and shape the muscles.